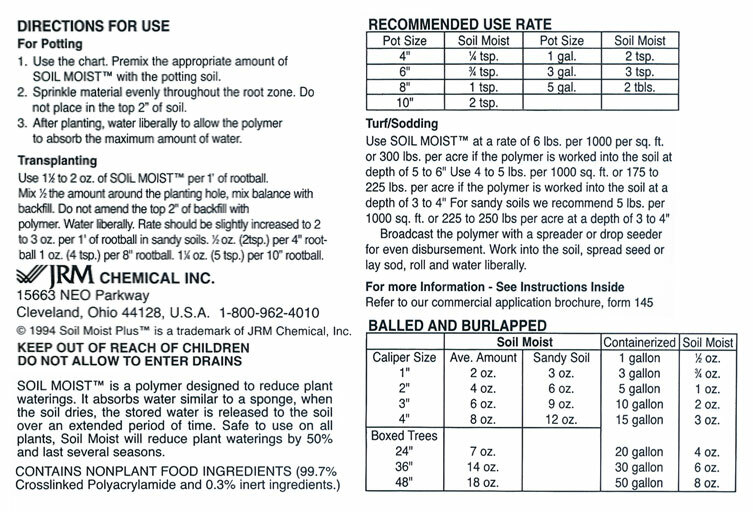 Soil Moist has been developed to reduce the amount of water needed to maintain vigorous plants. When mixed in the soil and water added, these amazing crystals will soften and absorb up to 200 times their weight in water! As the potting soil dries, the polymer will release its water to the plant. Soil Moist has been developed to reduce the amount of water needed to maintain vigorous plants. When mixed in the soil and water added, these amazing crystals will soften and absorb up to 200 times their weight in water! As the potting soil dries, the polymer will release its water to the plant. The expansion and retraction of the polymer during the watering cycle helps soil aeration for healthy, vibrant plants. this is the greatest stuff i've ever used it saves so much on watering time! This is wonderful for anyone who has window boxes and containers for their plantings. I no longer have to water my window boxes daily, once a week will do. I will never be without it since I have finally found a great source for it.